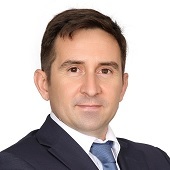 Jean-Francois has over 18 years of experience in the field of Business Development, Engineering and Construction across various sectors such as utilities, energy and renewables, and environment industries across various geographies. In his previous role as Technical Director with ENGIE ITALIA, he headed 3 separate departments; design, maintenance engineering, and energy efficiency. He was also responsible for leading the private development of the district heating scheme. Jean-Francois holds a Bachelor Degree in Mechanical and Electrical Engineering from Ecole Nationale Superieure d’Electricite et de Mecanique, France, and a Master of Business Administration from European School of Management, Paris, France.